The Obagi Nu-Derm System penetrates the skin’s surface to transform the skin’s appearance and helps correct the damage within, revealing healthy, younger-looking skin. Your skin care physician should determine your individual prescribed protocol and frequency of use, but you can expect to start seeing visible improvements in 4 to 6 weeks. Where can I purchase the Nu-Derm System from? The Nu-Derm System contains prescription-strength formulations that can be sold only through a licensed physician, such as an aesthetic doctor, dermatologist or plastic surgeon. Your doctor will discuss the procedure with you and, tell you how often you should check in once you’ve started using the Nu-Derm System. Keeping in mind that extended sun exposure damages the skin, it is suggested that you avoid prolonged sun exposure. While on the system, you can participate in normal outdoor activity. However, your skin may become sensitive to the sun and heat. This is particularly the case if you are using the Normal to Oily system. The Exfoderm® Forte contains an alpha hydroxy and it may increase your skin’s sensitivity to the sun and particularly the possibility of sunburn. It is very important to always wear sunscreen, like the Sun Shield Matte Broad Spectrum SPF 50 while in the Nu-Derm System, reapply sun protection every few hours while exposed to the sun, wear protective clothing, and limit sun exposure. Why should I use all the products included in the Nu-Derm System? All the products in the Nu-Derm System are specifically designed to work together to provide you with the best results. When used as a system, the prescription-strength ingredients work to effectively balance the pH level of your skin and penetrate into the layers of your skin for optimal results. Your skin care physician will guide you through using the system based on his or her assessment of your needs. 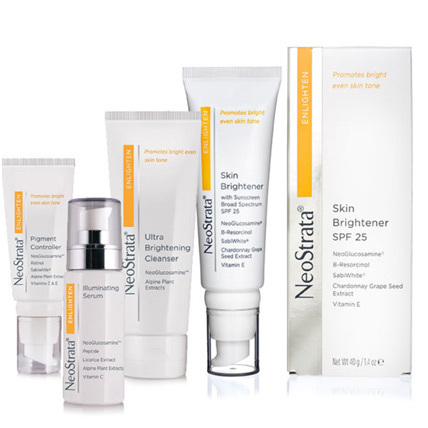 The Neostrata Enlighten range is formulated for the prevention and treatment of mild to moderate pigmentation. Apply to wet skin and gently massage to a lather over the entire face. Rinse well with water and pat dry. Use twice daily both morning and evening. Apply once a day after cleansing in them morning. Allow the serum to absorb before you apply the Skin Brightener. This product does not contain a sunscreen. Apply after cleansing and after applying the Illuminating Serum in the morning. Even though this product contains a sunscreen, if you are outdoors for prolonged periods always re-apply sunscreen throughout the day. Apply once a day after cleansing in the evening. If you are pregnant, planning on becoming pregnant or lactating you cannot use this product as it contains Retinol. As this product contains Retinol you need to be extra cautious when outdoors during the day and you should always apply a sunscreen in the morning.